To Do: Remake underskirt as it has worn out! Updates since last photo: none. Inspiration: Portraits of women from Cologne as well as middleclass women in various Trachtenbucher. I was inspired by woodcuts in Omnium pene Europae, Asiae, Aphricae atque Americae Gentium Habitus ( Diverse clothing of the nations of Europe, Asia, Africa, and America) in creating a dress for the winter. 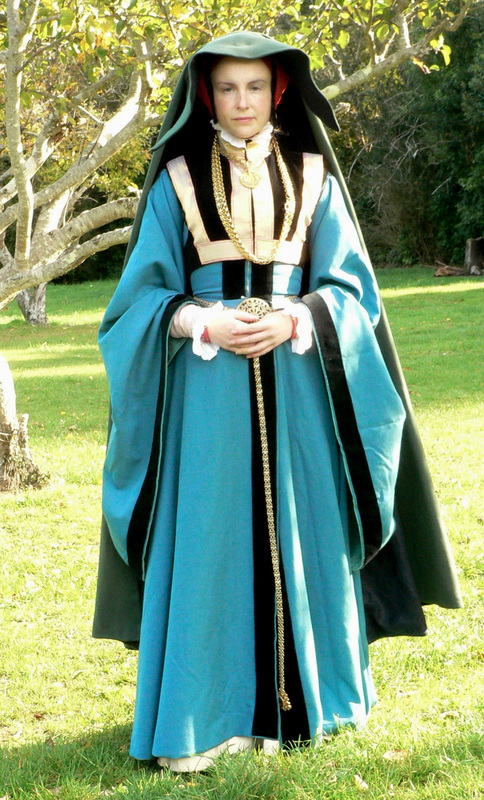 This gown was created using a wool twill in a very appropriate green tinted blue which is the most often seen shade of blue in portraits of this time and place. All guarding was sewn on by hand. 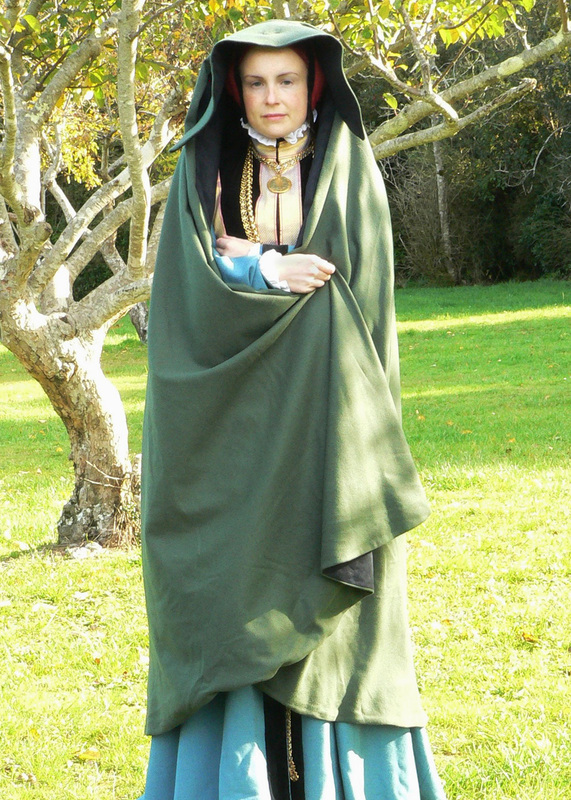 The Heuke (cloak worn from the head) is made from a mossy green wool flannel with a lining in dark blue linen. It is very heavy but very warm and doubles as a blanket if needed. To wear it properly requires both the hair and headdress to be pinned perfectly in place to create the right support. Due to period cutting techniques the entire wool and silk layers are each 5m of 150cm wide fabric (under 6 yards of 60″ wide fabric). 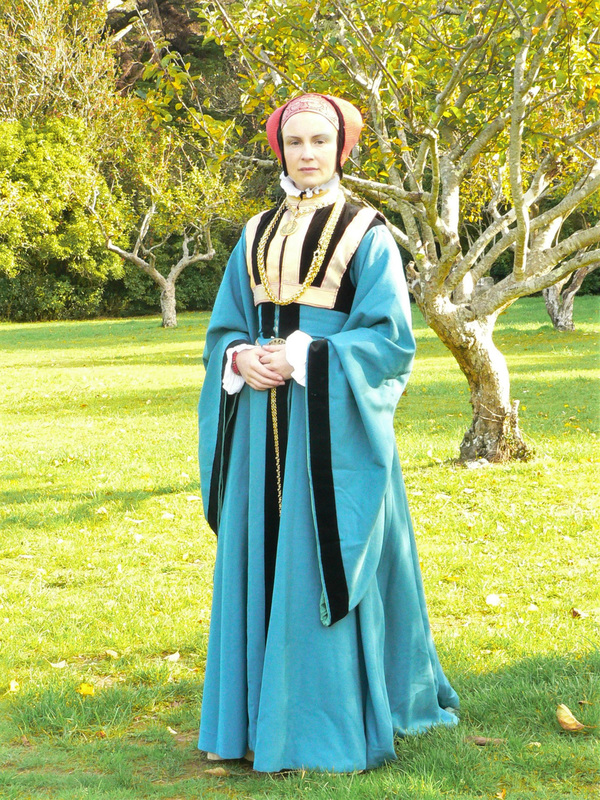 This does include the large hanging sleeves and allows for a hem of around 6m (over 6 yards). 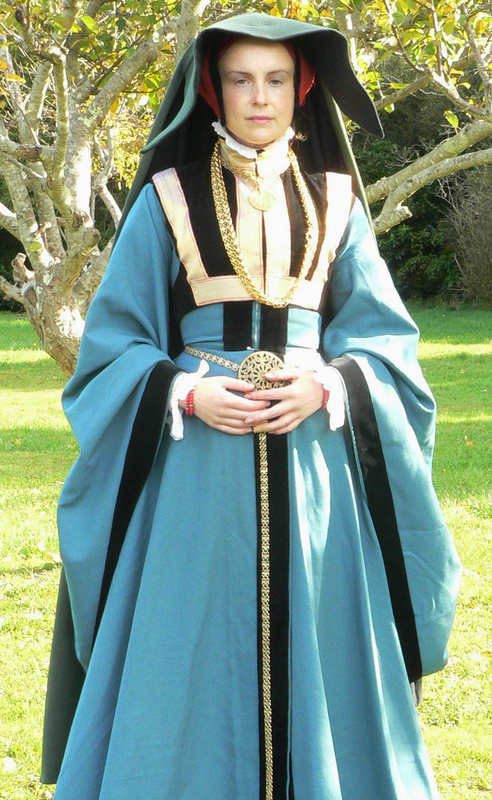 The skirt is made from four gored panels the fronts overlapping at CF as seen in portraits of this time (and most notably in the Anne of Cleves portrait by Hans Holbein). The backs are roll pleated to fit and whipped in place after the bodice and skirt were made and hemmed entirely separately. 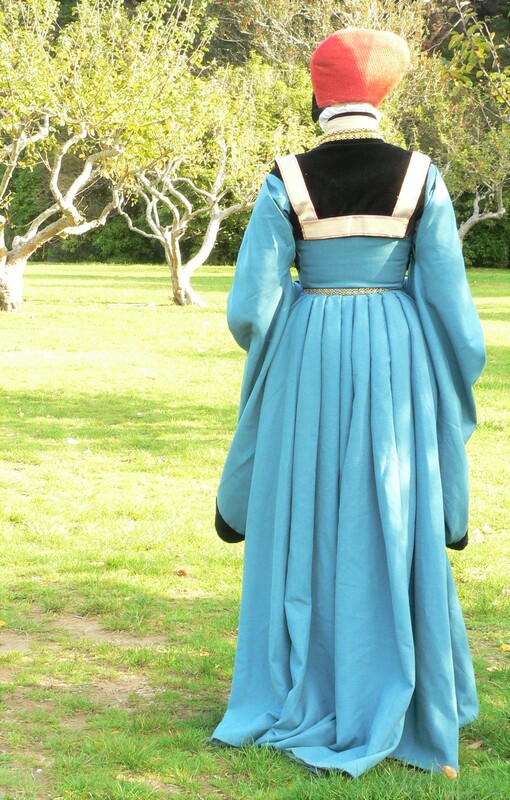 The bodice sleeves end at the elbow and the large hanging sleeves are pinned on at the shoulder. This is based on both textual and visual evidence of the time. The bodice has a rounded square neckline that is almost off the shoulder, the shoulders are cut entirely separately as the low necked bodices in tailors manuals of the time show (though these are sleeveless it does save a tremendous amount of fabric and allows the entire neckline to be cut on the straight making it extremely stable). The front of the bodice fastens with hooks and eyes and is shaped like a shallow S. The bodice is lined in silk and interlined in canvas. Two types of headdress can be worn with this style the Stickel (embroidered/brocaded shaped cap) or the linen cap with veil pinned to form hanging tails. The hanging tails are optional but do provide additional interest to anotherwise stark fashion. The headdress is made from a shell of red tinted brocade (left over from my Braunchweig gown) over a based of felt covered buckram. It is lined in habotai silk. These can be worn with a narrow starched band framing the face (most common) or with plaits (braids) of hair that loop in front of the ears and under the cap near the temples. This seems most common in the first half of the 16thC, less so in the latter. The Klyren (goller/shoulder covering) is the same as I wear with my Braunchweig gown and is semi shaped but pinned in plased rather than sewn under the arms or tied under the arms. This is not very practical however with everything else pinned in place it is not much more work. The linen headdress takes the longest to assemble and pin in place. The skirt fronts can be pinned back as seen in the trachtenbuch (no longer on display at the LACMA website, however some b/w illustrations are still on Bildindex.de) and as per my linen version of this style.